Cover Love includes a cover, blurb, buy links, and social media contacts for the author. 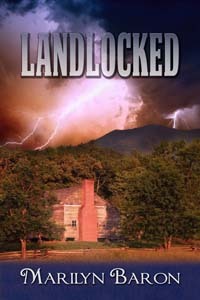 Today's featured book is Landlocked by Marilyn Baron. Sparks fly when Amelia announces her plans to move into her grandmother's cabin until she can sell the property. It is Alec’s current home, and he’s not giving it up. When Amelia discovers that thirty years ago a prominent landscape artist disappeared in the town of Confrontation, she is anxious to solve the decades-old mystery, but there’s a serial killer on the loose, one nobody wants to turn in, despite the number of people missing. What is the community hiding, and does Alec know where the bodies are buried? Marilyn Baron is a corporate public relations consultant in Atlanta. She’s a member of Marketing for Romance Writers, Romance Writers of America and Georgia Romance Writers (GRW), recipient of the GRW 2009 Chapter Service Award and winner or finalist in writing awards in single title, suspense romance, novel with strong romantic elements and paranormal romance. Marilyn writes in a variety of genres, including: Humorous coming-of-middle-age women’s fiction (The Widows’ Gallery, Stones, and Significant Others); a psychic suspense series (Sixth Sense, Homecoming Homicides and Killer Cruise); romantic suspense (Landlocked); fantasy (Someday My Prints Will Come); and historical romantic thrillers (Under the Moon Gate and the prequel, Destiny: A Bermuda Love Story) for The Wild Rose Press; and humorous paranormal short stories for TWB Press (A Choir of Angels, Follow an Angel, The Stand-In Bridegroom, Dead Mix and The Files Death Forgot). Marilyn is a member of the 2016 Roswell Reads Steering Committee and belongs to two book clubs. A native of Miami, Florida, Marilyn now lives in Roswell, Georgia, with her husband and they have two daughters. She graduated from The University of Florida in Gainesville, Florida, with a Bachelor of Science in Journalism [Public Relations sequence] and a minor in Creative Writing. When she’s not writing, she enjoys reading, going to movies, eating Italian food and traveling. She often sets her stories in places she’s visited, including Bermuda, Australia and Italy, where she spent six months studying in Florence during her senior year in college. It's great to be back. Thanks for featuring Landlocked, my 10th book with The Wild Rose Press. I'm looking forward to reading this, Marilyn. Always enjoy your books. Thanks, Diane. I appreciate that. Thanks for commenting.